Where did I get it? I've owned this book for five years, since I first ever heard of Annabel. I tried to read it then, but only got about fifty pages into it. It didn't grab me, so I didn't finish it. I did however get the book signed by Annabel around about the time I bought it. What's it about? Jamie's sister Rose lives on the mantelpiece, in an urn. She was killed in a terrorist explosion five years ago so Jamie, who is ten, barely remembers her. Everyone else in his family finds it hard to live without her, though - Dad drinks too much alcohol, Rose's twin Jasmine doesn't eat and dyes her hair pink, and Mum has just left. Jamie, Jas, and Dad move up to the Lake District, supposedly for Dad to start a new job, so Jamie has to start a new school. There, he's bullied by some of the girls in his class, but he also makes friends with Sunya, the girl he sits next to. The problem is Sunya is Muslim, and Dad blames all Muslims for Rose's death, so Jamie knows they can't be friends. Meanwhile everyone is falling apart, and Mum hasn't even been to visit. What age range is it for? 9 years plus, but I would make sure the child knew about things like the 9/11 attacks first - in an age appropriate way, obviously. Are drugs mentioned or used? No, but there's misuse of alcohol which may be painful to read. Is there any talk of death? Yes, and obviously, due to Rose's death, it can be graphic. Jamie's imagination runs away with him at times. What criticisms do I have? Once I got into the book I actually really liked, but I do think the first few pages could be more gripping. Maybe it's okay for the age group, but if the book skewed a bit older it would need to be more exciting. I knew loads of people who had really enjoyed the book, but to begin with I really didn't understand why. It took me a while! Would I recommend the book? Yes, absolutely. 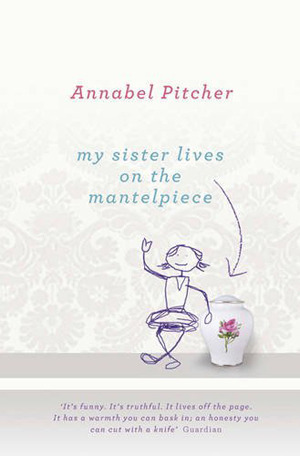 I've read three of Annabel's books now and I would recommend them all. Why did I choose to read it at this point in life? Well, it was actually my choice for my book club. It was on our list of available books and I, as the children's/Young Adult aficionado in the book club, I thought it would be good to make all the others read something for this age group. I can't wait to see what they all made of it! What other books is it like? It's a lot like The Last Days of Archie Maxwell by Annabel, because it doesn't flinch from painful realities. It's a lot like Two Weeks With the Queen, too, I think, a book that I will absolutely have to reread this year! Where is the book going now? Because it's signed I will of course keep it! It's not my favourite by Annabel but I did like it and I want to support her writing.